Brown rice does not differ from whole grain rice because they are one in the same. Whole grain rice is simply rice that has its entire grain intact, which is the case with brown rice. 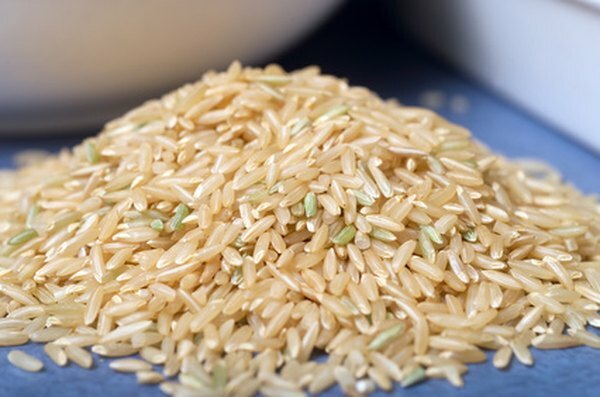 Brown rice is not the only whole grain rice -- wild rice also fits the description -- but white rice does not fit the bill because it lacks all the grain’s components. Whole grains are plant seeds that still retain all their components. Grain components include the kernel, bran, endosperm and germ. The kernel is the large part of the grain that has the endosperm inside it. While the endosperm is the bulkiest part of the seed, it only contains small amounts of nutrients. The bran is the kernel’s outer coating that contains most of the grain’s fiber. The germ is a small component inside the kernel from which new plants sprout; it is a rich, concentrated source of nutrients. Brown rice contains the whole rice grain while white rice is refined, a process that removes the outer coating, or bran, and the nutrient-rice germ from the seed. The recommended daily dose of whole grains is at least three servings per day, with each serving containing at least 1 ounce of whole grains. One-half cup of brown rice is equivalent to a 1-ounce serving, which means you could fulfill your whole grain daily dietary requirement with a 1.5-cup serving of brown rice. Because their bran and germ is still intact, whole grains are a rich source of fiber, which helps you feel full longer because your body does not digest it. Brown rice and other whole grains are also high in vital nutrients such as magnesium and potassium. A half-cup serving of cooked long-grain brown rice has 108 calories, 2.5 grams of protein, 22 grams of carbohydrates and 1.8 grams of dietary fiber. It is low in fat, at less than a gram per serving, and contains almost no sodium or sugar. Brown rice also provides you with minerals, including 42 mg of magnesium -- 13 percent of the recommended daily intake for women -- as well as 10 micrograms of selenium, or 18 percent of your recommended daily intake. Substituting brown rice for white rice as a side dish is one way to get more brown rice in your diet, but you can also include it in a number of recipes and dishes to increase your whole-grain consumption even further. Ideas include adding brown rice to soups, casseroles and stews, or even adding a bit of cooked brown rice instead of nuts atop a salad. Adding cooked brown rice to ground meat can give extra body to the meat for meatloaf, burgers or meatballs. In addition to brown rice and wild rice, other whole grains include barley, millet, oatmeal, bulgur, popcorn and whole-wheat bread, crackers and pasta. Is White Rice a Complete Protein?